'Dinner for Schmucks' never reaches its full potential. This is a sad thing for me to admit, what is even worse is that I had to slowly find this out as the movie slugged along for its full two hour run time. The odd but refreshing premise is a take off from a German film I've never seen or am likely to see, and as amusing as this may have sounded on paper and no doubt promised some serious laughs as the cast tossed ideas around that could go along with the premise-it just never gets there. How this happened is a very good question. Jay Roach who has crafted classics such as the 'Meet the Parents' and the 'Austin Powers' films, not to mention his work with Jim Carrey back in the day, is working with two of todays best and most popular funnymen, check. It is great and exciting to see Rudd and Carell on screen together again and they play off of each other well, check. The supporting cast here is comically amazing-Galifianakis, Dunham, Clement, even Livingston and Bruce Greenwood contribute their own funny bits, check. All of these elements should contribute to what should be one of the funniest films of the year. The key word in that last sentence is "should", stating what this movie very easily could have been. Instead what we have is a pretty good comedy that is seriously elevated by the committed, ridiculous and always charming performance of Mr. Carell. While Rudd is stuck playing the straight man for the second time in a row, which isn't necessarily a bad thing, but the act is too thin here whereas in 'I Love You, Man' his character had a ton more depth to him. 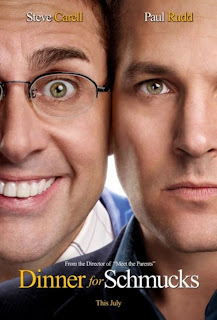 Its understood that Carell is playing the idiot, and as he has done for six years on 'The Office' and did to perfection in 'Anchorman' Carell knows his obnoxious idiots back and forth. Barry is the ultimate unwelcome friend, the guy who literally messes up everything, including Tims relationships, business deals and so forth. The magic of the film is that Carell is still able to make us like him and his obnoxious Barry much more than Rudds Tim. Honestly, this is one of the only redeeming qualitites of the film-Carell scores most of the laughs (the ones he doesn't get going to Clement) and he makes the movies trek to get to the climactic dinner durable. And so, after way too long we do get to the dinner and this scene in particular raises the films overall score from an average three stars to its three and a half final grade. The competition and no doubt endless improvisation by Carell and Galifianakis is pure gold and are nothing short of a grand payoff for some of the more slowly paced parts earlier in the film. Yes, 'Dinner for Schmucks' never reaches its potential, but it comes really close at times, enough for it to be recommended. If only they had really went for it, Carell did, shame on you Mr. Roach for not backing him up.